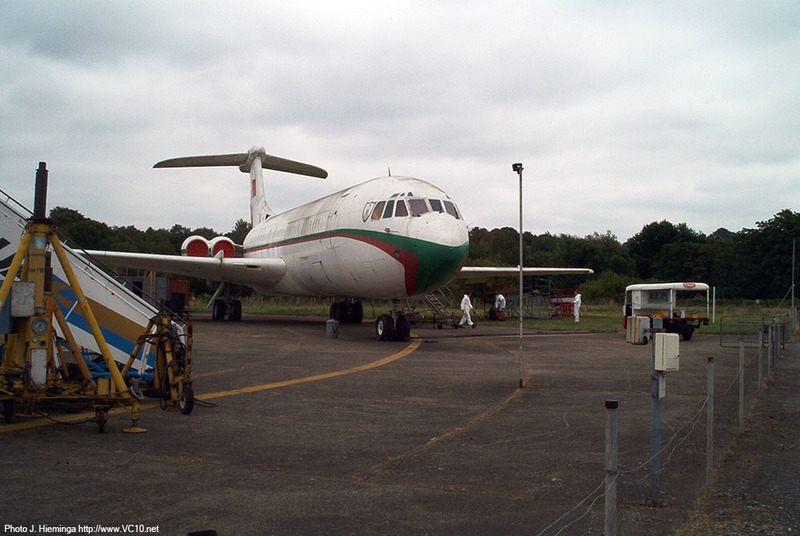 The Brooklands Museum is situated on the site of the former Brooklands racetrack, which was also the main development and production area of the British Aircraft Corporation’s Weybridge Devision, formerly known as Vickers-Armstrong. Between 1907 and 1939 the racetrack built by Hugh Locke-King was one of the focal points of the British motorsport scene. The 3.5 mile long banked track being the first of its kind to be built in Europe. From 1908 on the area inside the track was seen as a perfect place to fly aircraft from and apart from many other famous aviation names that flew from Brooklands, it became the home of the Vickers Aircraft Factory. Famous in the Second World War for the Wellington bomber, after the war the successful Viking, Viscount and VC10 were built here. 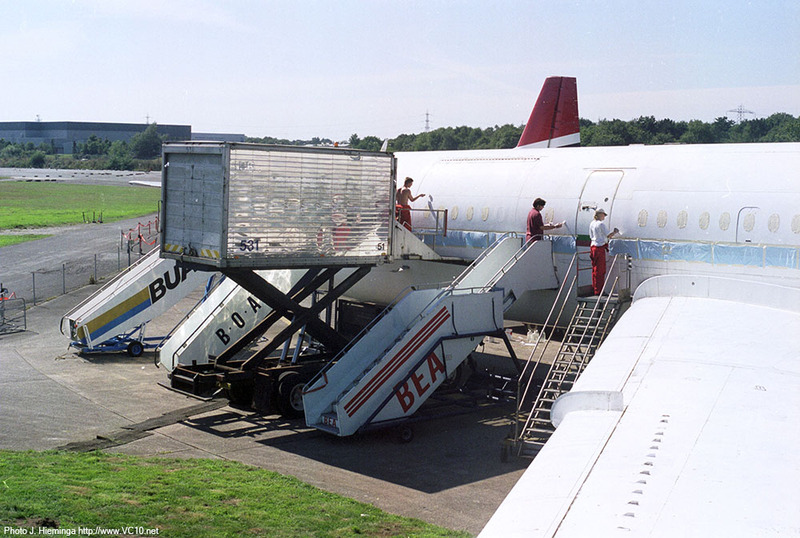 Next to this, after the consolidation of the British Aircraft industry into BAC the site remained an important design office, working amongst other projects on Concorde. The Museum is located on a large area on the north side of the original racetrack, and includes the original Member’s Banking and the 1930’s clubhouse as well as several other buildings connected to either the motoring or the aviation heritage of the site. In and around these buildings a large collection of cars, aircraft and other items is displayed, including the only surviving Wellington Bomber that actually saw service in the Second World War. 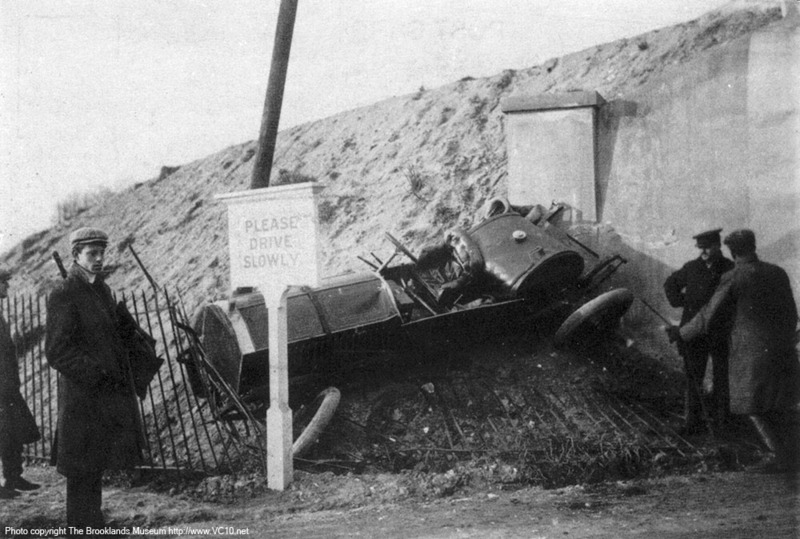 The early 'racing days' at Brooklands: H.C. Tryon's six-cylinder Napier after spinning several times and leaping from the Member's Banking to the road below. January 2nd, 1908. The Brooklands racetrack seen from the air, probably before 1930. The airfield is at the top of the picture inside the track. 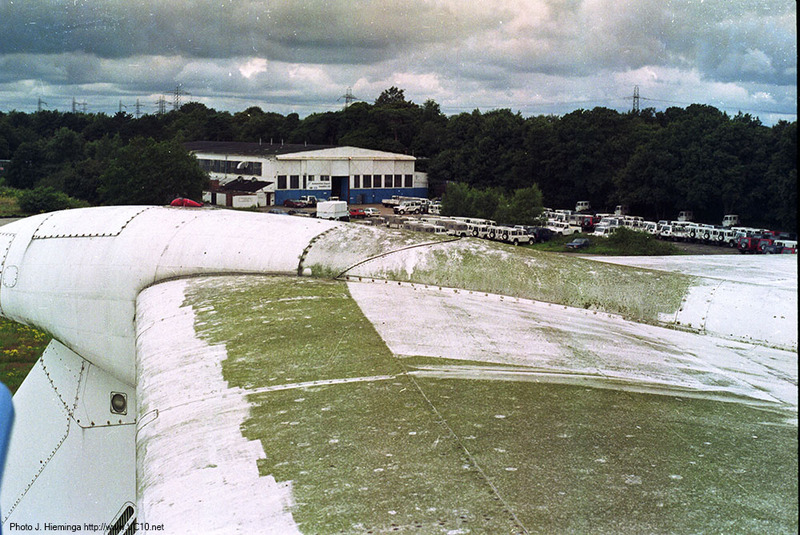 The Brooklands Museum summer project was conceived in early 1998 to achieve a double goal; firstly it would provide European aeronautical engineering students with practical engineering experience, and also it would provide the museum with a very valuable workforce through which the life of the exhibits can be extended. During the project the students worked in small groups around the museum on several different tasks. They were supervised by museum volunteers, usually retired licensed aircraft engineers or volunteers with experience in the engineering environment. With Mike Roach as the link between the museum and the schools, students from Hogeschool Haarlem in The Netherlands, ESTACA and EPF in France were given the opportunity to gain experience in several restoration tasks. Major goals achieved: VC10 horizontal stabiliser cleaned & painted, RH main undercarriage cleaned & painted, survey carried out on the VC10. 1. 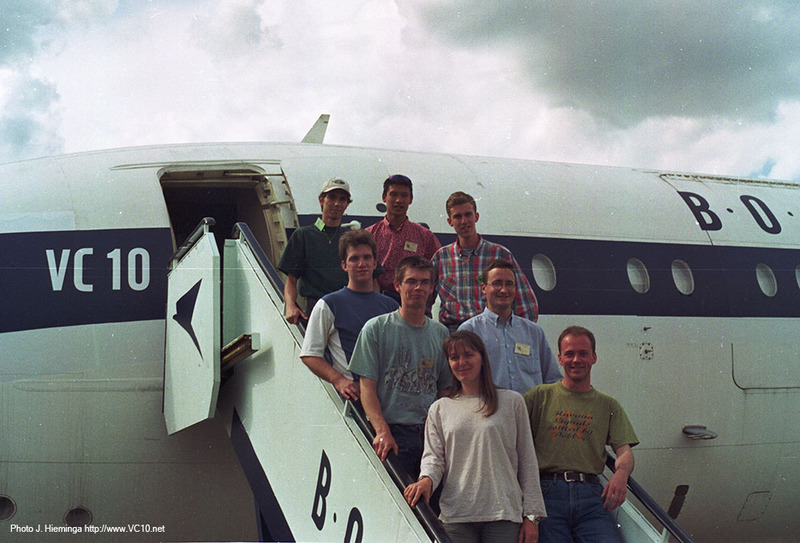 The students involved in the 1998 project. 2. 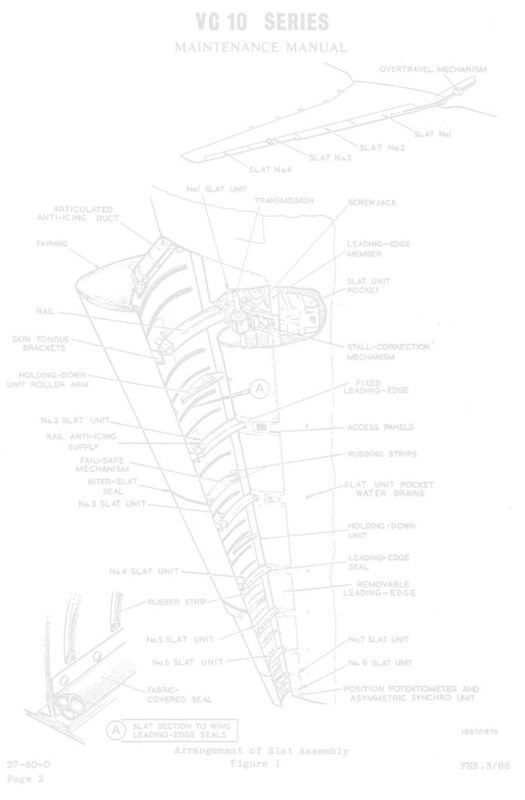 One of the major issues that needed some attention was the horizontal stabilizer on the VC10. 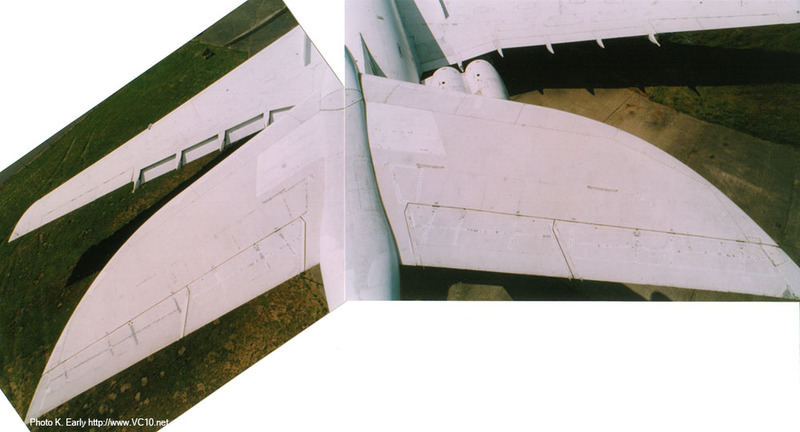 After almost 11 years the upper surface didn't look as clean as when the aircraft arrived, as this photo shows. 3. 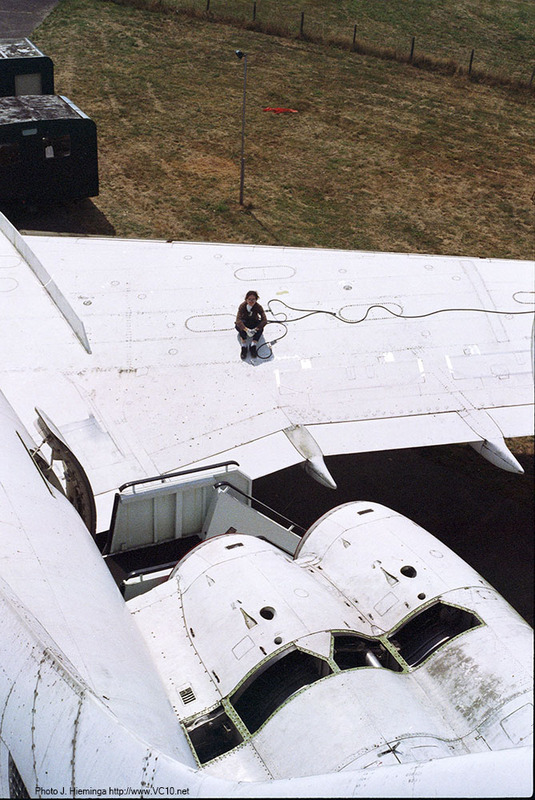 So how to clean a VC10 tail? Remember it is 40 ft high! Well, the basics are a high pressure cleaner and some high access equipment that the museum rented for this purpose. 4. 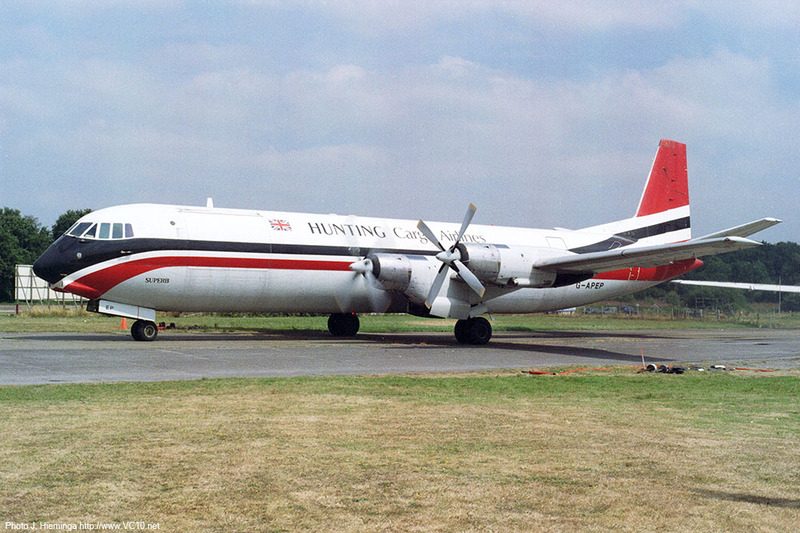 The results were promising, the tail now had the same colour as the rest of the aircraft. 1. The next step was a bit of painting. Part of the painting crew is shown. 2. 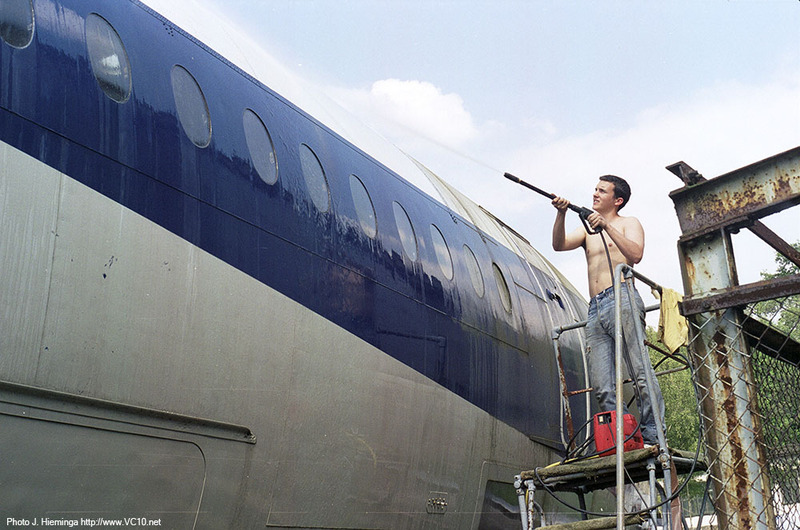 Obviously other parts of the aircraft needed some attention too. 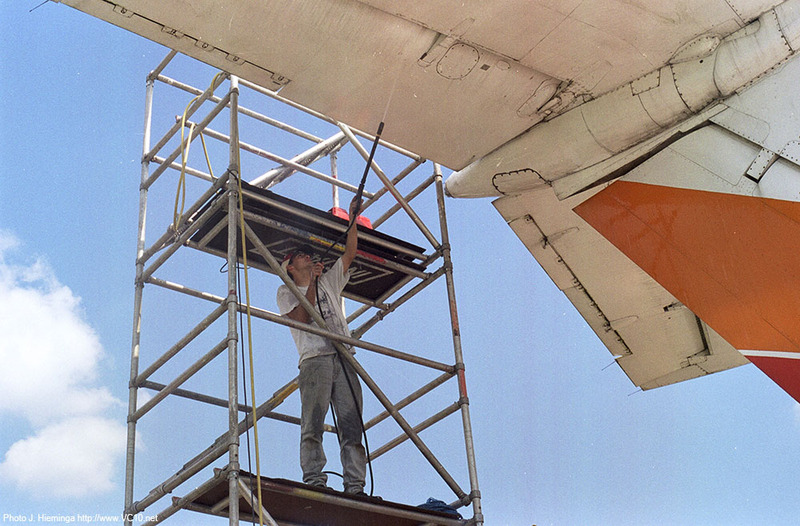 Corrosion removal on the upper wing surfaces for example. 3. Although a lot of work was done, we usually managed to find some time for less strenuous activities. 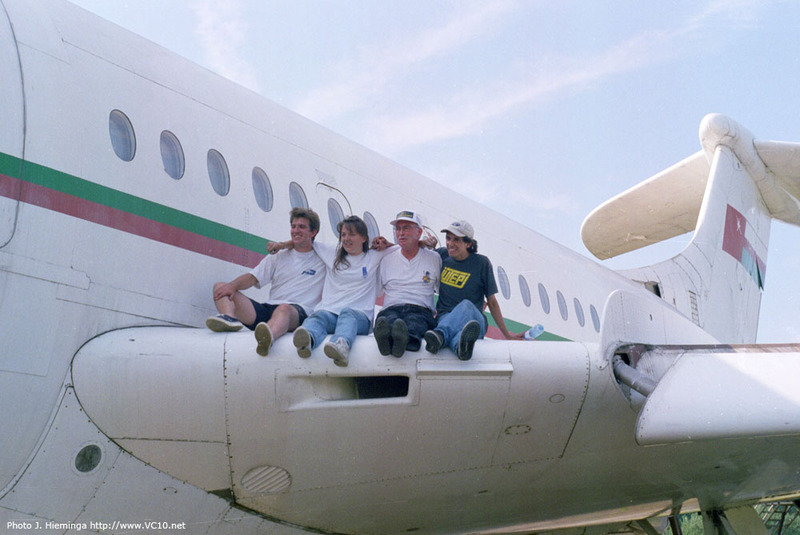 Here, Kevin Early poses with Arnoud, Claire and Jose on A4O-AB's wing. 4. 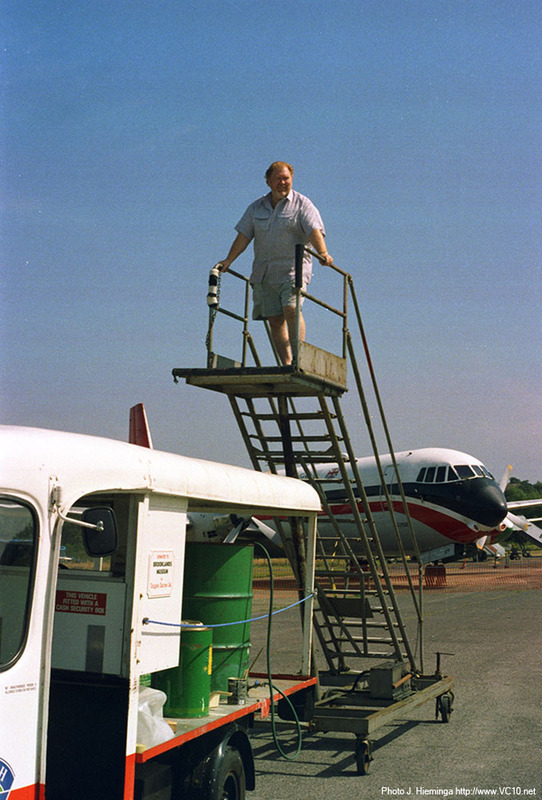 A lot of access equipment and other tools were used during the project, including the museum's trusty electric Milkfloat and several sets of stairs. 'Ginger' Wright poses on top of a set in this photo. 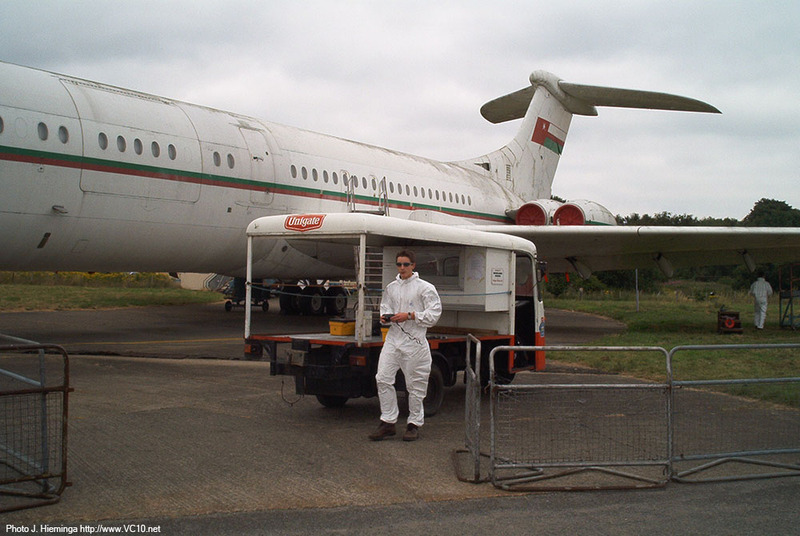 Major goals achieved: VC10 wings and fuselage completely clean of corrosion, Vanguard tail section cleaned & treated where necessary, Undercarriages cleaned and painted on BAC 1-11, Hawker Hunter and Vickers Varsity. 1. 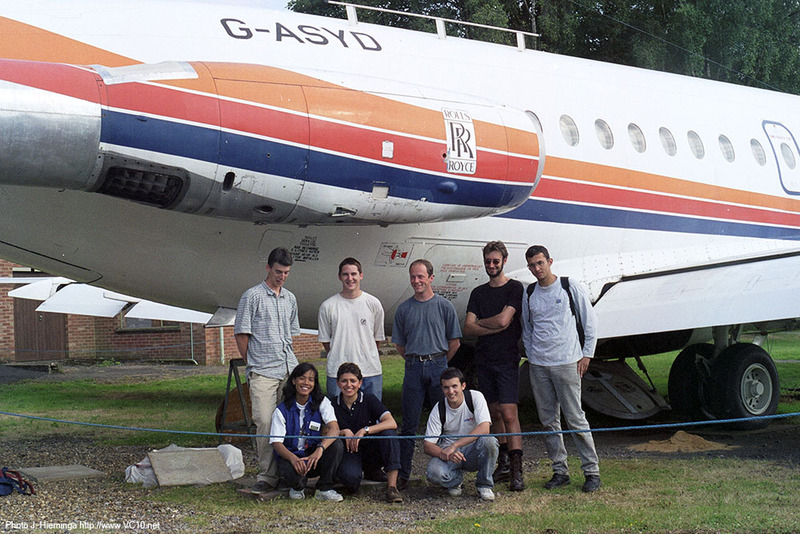 The students involved in the 1999 project with 'Ginger' Wright and Julian Temple. 2-3. If you are going to use high access equipment on a Vanguard tail, you don't want that tail to be sticking out over grass. So what do you do? Fire up two engines and taxi her out of course. These pictures show G-APEP moving under her own power. 4. And here's the reason she was moved. 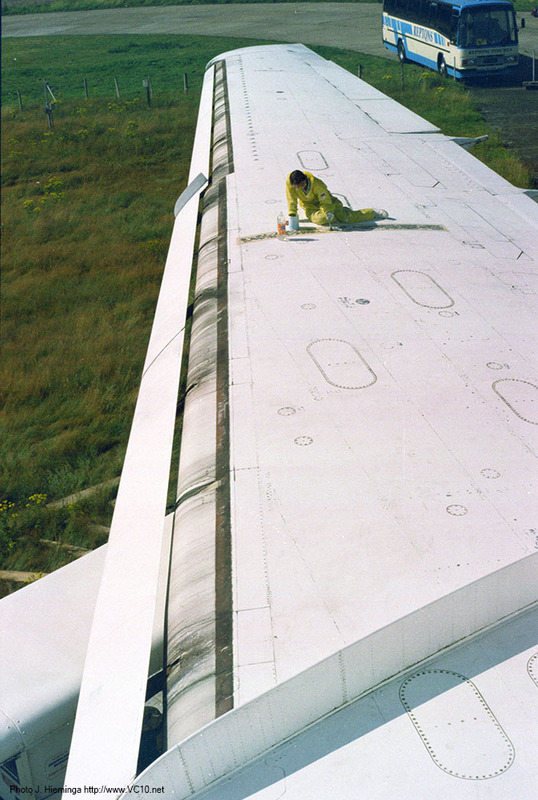 Cleaning and corrosion removal on the tail section. 1. 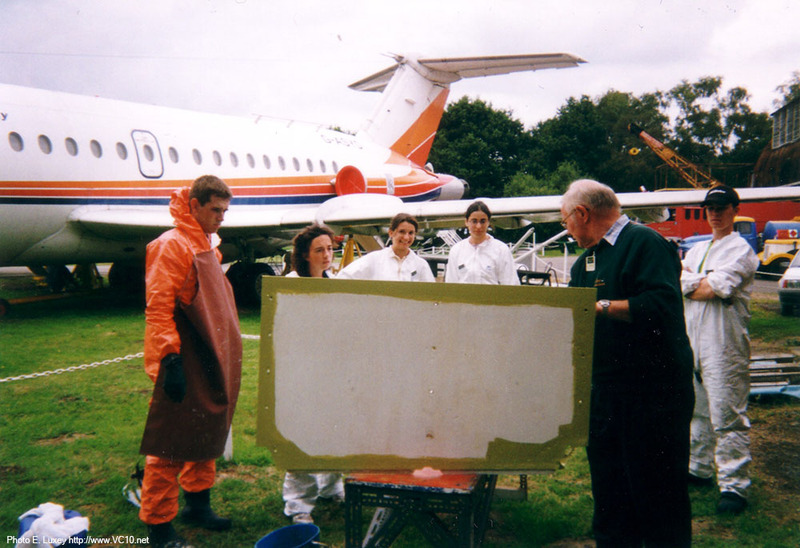 Painting after corrosion removal on the VC10 fuselage. 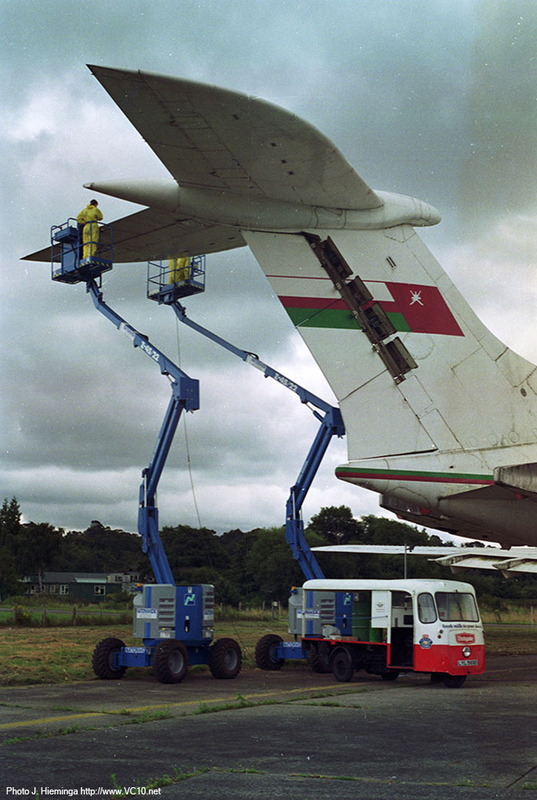 The access equipment in use shows a variety of airline markings. 2. Remember that a VC10 is not a small aircraft. Even so the upper and lower surfaces have been completely cleaned of corrosion during the 1999 project. 3. 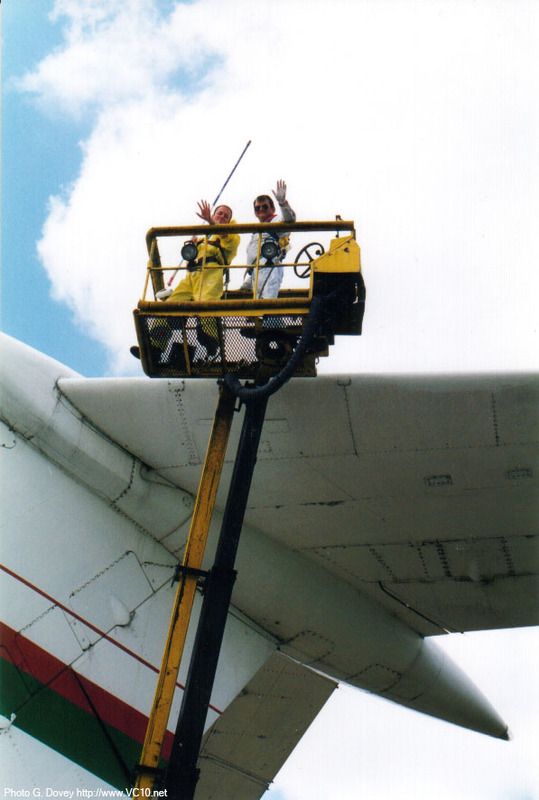 Another task that was carried out was cleaning the Viscount. 4. Where to have lunch? 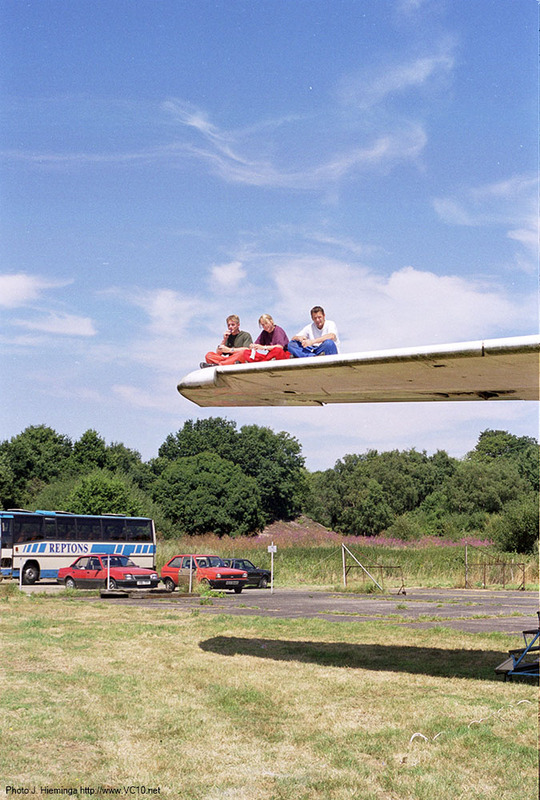 Wouter, Famke and Jasper had the best seat in the house. 1. Julian Temple, Famke, 'Ginger' Wright, Mike Roach, Jasper, Wouter and Francois. These four students spent three months at the museum as an internship project while other groups rotated for shorter periods. 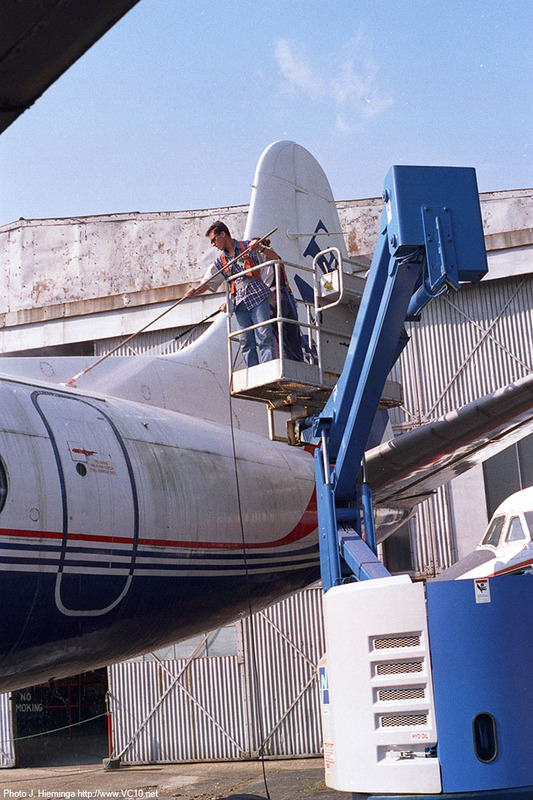 Major goals achieved: Corrosion removal and treatment on Viscount G-APIM. Preliminary restoration work carried out on Viscount XT575 cockpit section. Painting of Vickers Varsity and several restoration tasks on BAC 1-11 and Hawker Hunter. 1. 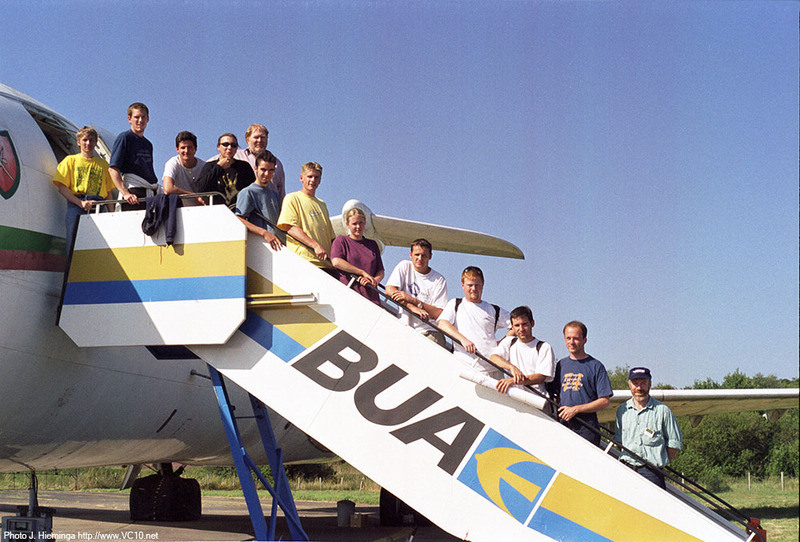 Some of the students involved in the 2000 project in front of BAC 1-11 G-ASYD. 2. 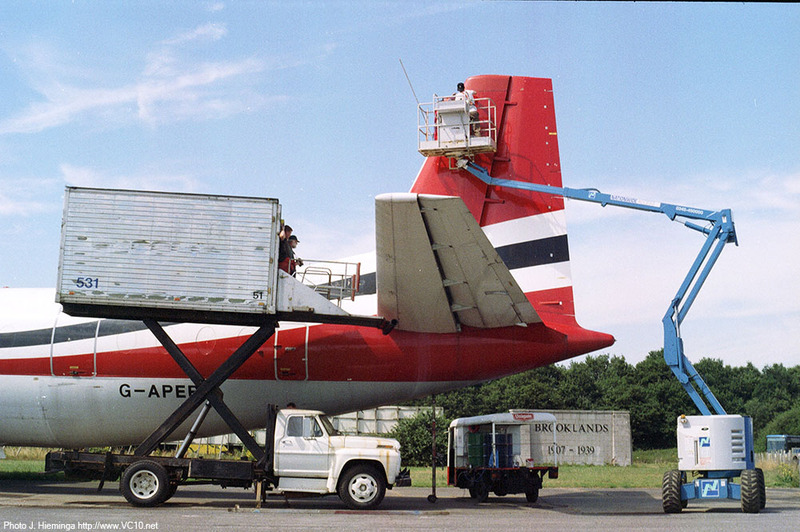 The 2000 project started out with a lot of cleaning, on this picture the tail of BAC 1-11 G-ASYD is getting some attention. 3. Next in line was the VC10 forward fuselage section. This is a static test specimen that was used for water tank tests. 4. 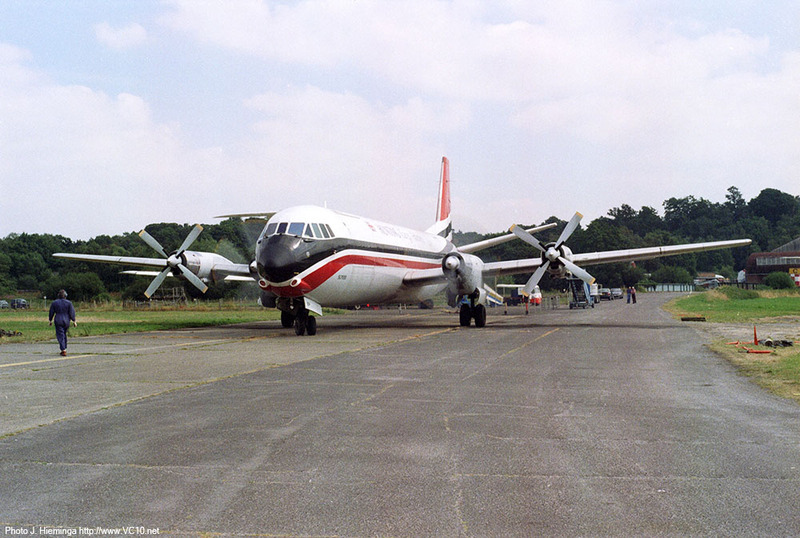 Another aircraft that was due for some TLC is Vickers Viscount G-APIM. Corrosion treatment on the cockpit area was a major focus. Major goals achieved: Corrosion removal and treatment, cleaning, patch repairs, removal and installation windows on BAC 1-11, inspection of tailplane Hawker Hunter, installation rudder on Vickers Viking, drilling holes and installing bolts in center wing section Hawker Hurricane. Major goals achieved: Corrosion protection and restoration on VC10, 1-11, Vanguard and Hawker Hunter, construction of display engine stand, refurbishment of TSR.2 nose section. 1. 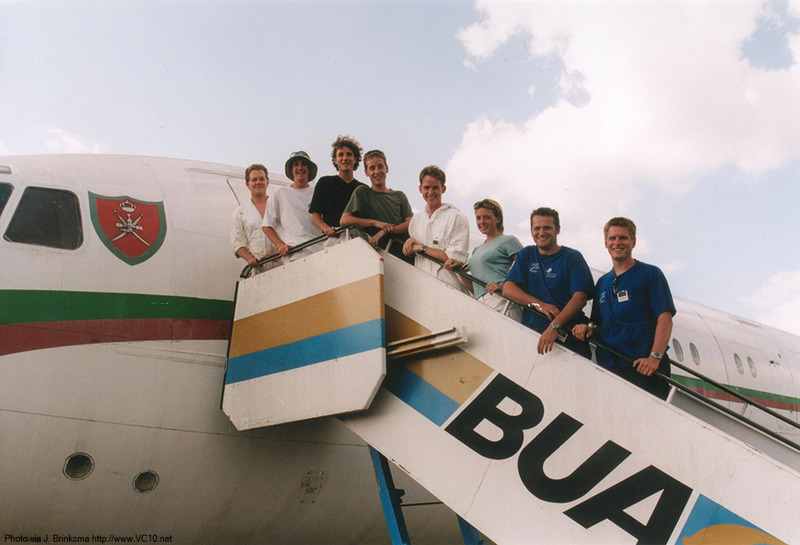 This time Vanguard G-APEP is the background for a group photo of some of the 2002 students. 2. The VC10 is getting some attention again during this year's project. 3. 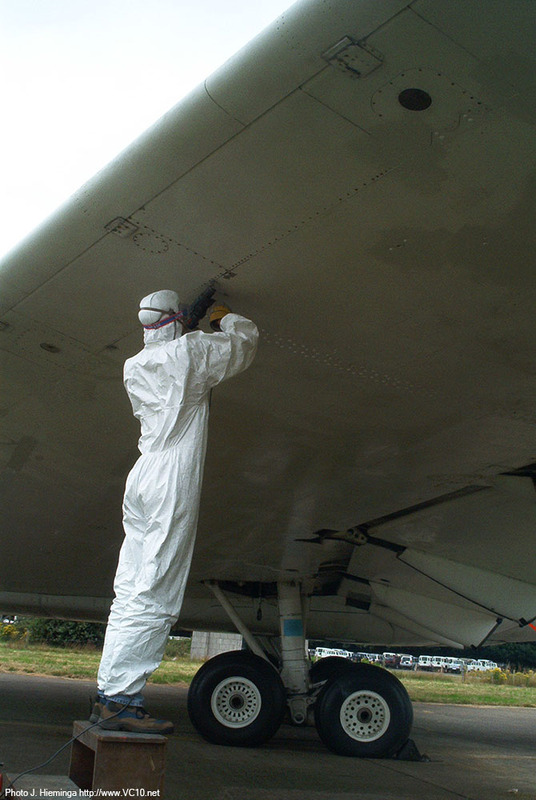 Some small corrosion spots under the wing receive treatment. 4. The Milkfloat shown in this shot is a much used vehicle during any Student Project! 1. The spoiler/speedbrake area on BAC 1-11 G-ASYD is the focus of some cleaning work. 2. 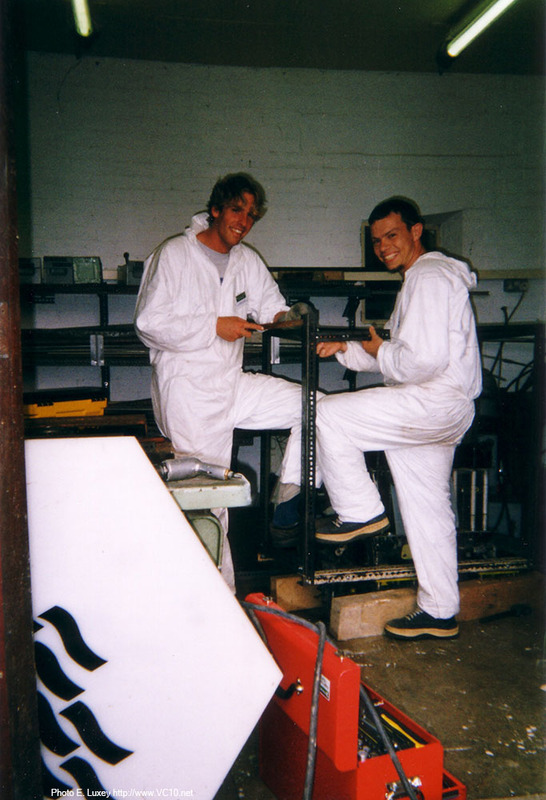 Another 'major' task was the fabrication of an engine stand for a Gipsy Major engine, looks like these guys are happy with their work. 3. 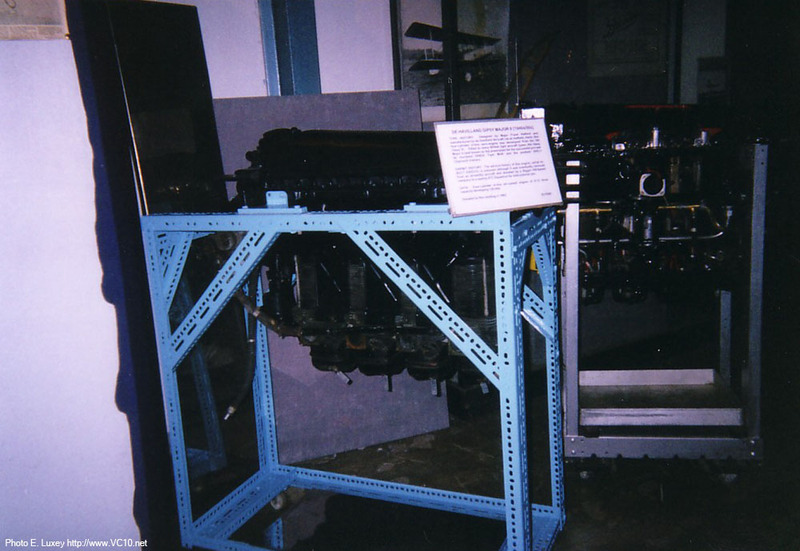 And this is the stand that was built, with Major engine in place. 4. Long time project mentor Ian Cooper is explaining what to do with this underwing PCU panel from the VC10. Unfortunately there never was a 2003 Summer Project, the available budget just didn't allow this. 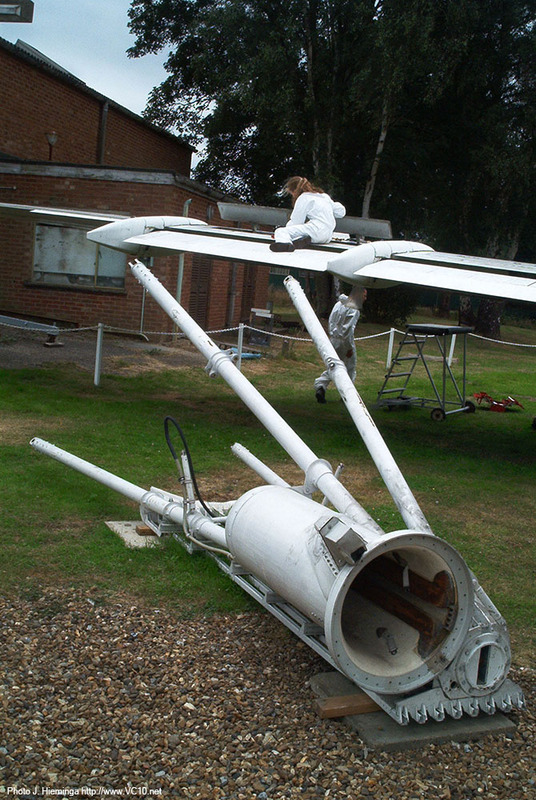 2003 saw several large projects pending at the museum some of which were the refurbishment of the Wellington Hangar, a listed building from the WWII era, and the imminent arrival of Concorde 202 G-BBDG which was due to be restored at the museum. Also the resident Hawker Hurricane restoration was slowly progressing. There were many more things going on at the museum and as an organisation largely driven by volunteers and donations, money is always tight. For this same reason there would not be a 2004 project, however unfortunate this was for the students that would have liked to participate. 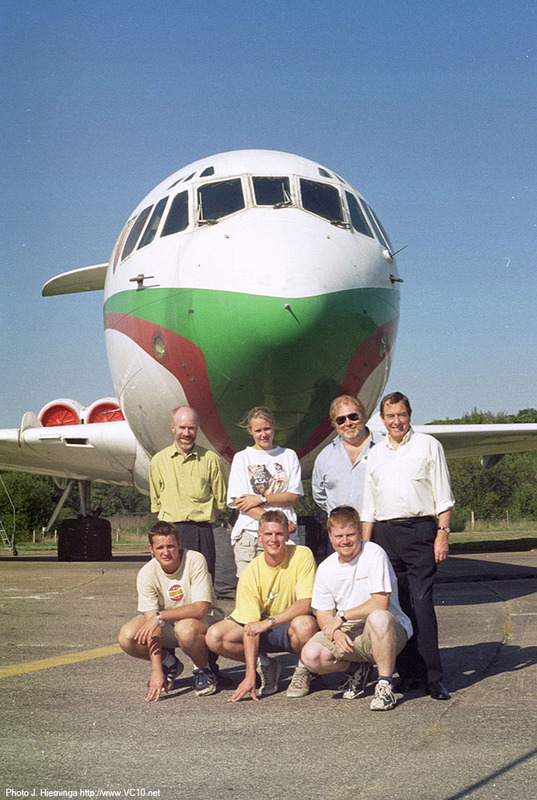 Since 2002 the project has not been active in the form as described above, but the restoration of Concorde G-BBDG has benefited a lot from the involvement of students from a local university. It is therefore safe to say that the lessons learned have not gone to waste. Even if economics have been against running any more student projects at the museum, there's no telling what the future will hold and I'm sure that in time there will be more to report on this front. For more information about what's going on at the museum have a look at their excellent website: Brooklands Museum.